I have been waiting for four long weeks for my first Stitch Fix to arrive, so you can imagine how excited I was to see the box sitting there waiting for me. 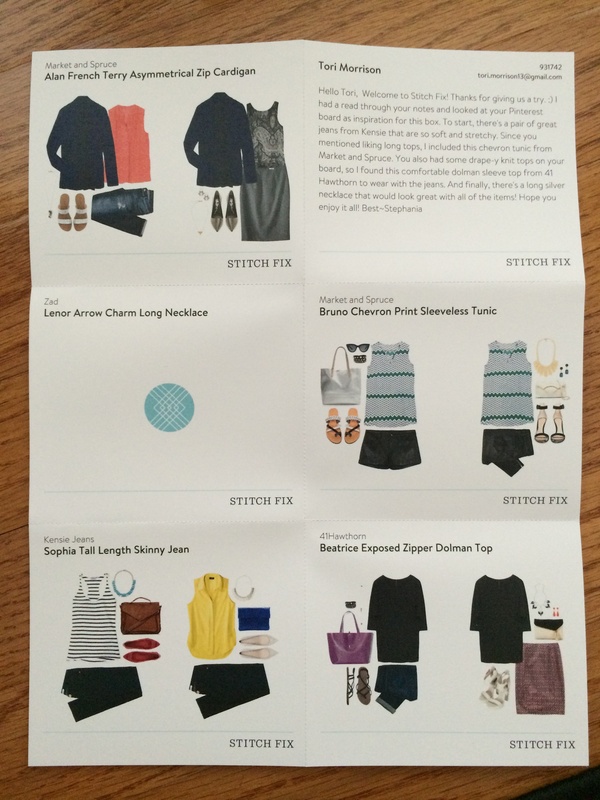 For those of you who don’t know what Stitch Fix is, it’s essentially a personal styling service. The entire process is pretty easy: you create a style profile, choose a date to receive your box, and then wait for it to arrive! When it hits your doorstep, you’ll have five great items to choose from and you can either keep them all and get a 25% discount, or you can send back what you don’t want for no charge (Please note: there is a $20 styling fee that you can use toward any purchases you make from your box). Did I mention shipping is also free both ways?! I read a lot of reviews about Stitch Fix before signing up for the service, so I knew going into it that I needed to be specific. I created a Pinterest board of clothing items I liked and I also took the time to create a detailed note to my stylist. I told her that I didn’t want any dresses and that I only wanted one accessory item in my first fix. When I opened my box, I was greeted with this wonderful card from Stephania, my stylist. She included one necklace, three tops, and one pair of jeans in my fix, so I was happy right off the bat to see that she listened to my requests. 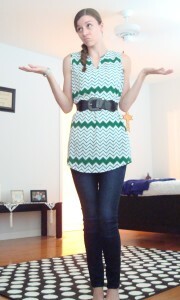 Since I’m tall and like to wear some things a little baggier than others, Stephania sent me the shirts in a size small. 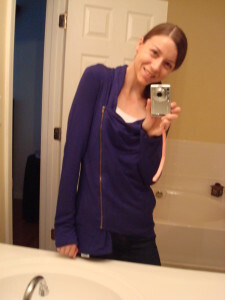 I’m sorry that I’m not very good at taking pictures of myself in front of the mirror, but I at least wanted you to see what the side zip up looked like on this super comfortable cardigan! This is probably my favorite item out of my first fix because the material is amazingly soft and the fabric is heavier – perfect for fall! Stephania must have saw that I really like these tops because I had a few posted on my Pinterest board. I have been purging my closet in hopes of getting some great items from Stitch Fix and Golden Tote, so I was so happy to see this top in my box. 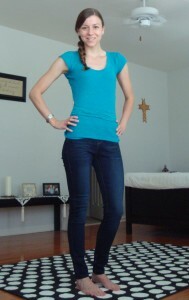 I struggle with jean shopping sometimes because I’m tall and small, but I also have some muscle in my legs. My initial reaction to these jeans is that I wished they were in black, but I was happy to get another pair of skinny jeans since I plan on wearing boots a lot this season (especially since my wonderful man just bought me the cutest pair of ankle boots)! 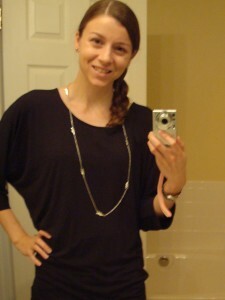 I’m also wearing the jeans in the picture with the dolman top. You can see that they actually fit pretty good! They are super comfortable and seem to be made of good material – always a plus in my book. I was surprised to see that all of my friends thought I should keep this top! The smaller print is actually a very close blue to the cardigan I got, so they would go great together. After deciding that I needed to step out of the box a little bit, I made a decision to try it out! I’ve been in need of a long necklace for awhile, and since I was keeping everything else in my fix, I decided that I could definitely make use of this piece. That’s right – I kept all the items in my first fix. I have to say that I’m a little surprised because I honestly thought I was going to end up sending back at least two things before I got my box, but Stephania did a great job of styling me! Getting my fix was like having Christmas in August! 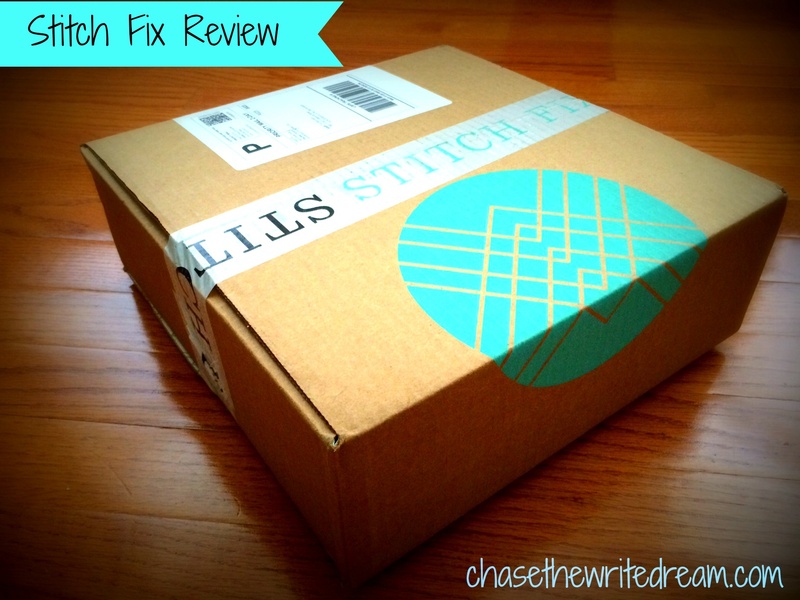 If you are on the fence about trying Stitch Fix, I think you should at least give it a shot! As long as you express your wants, you’re specific with your stylist note, and you have a good idea of what size you are, then I’m sure you can get a great fix as well. If you’d like to read more reviews, check out Kelly’s November 2014 Stitch Fix Review at Primally Inspired! Which of these items is your favorite? Golden Tote vs. Stitch Fix: Which Online Styling Service is Better? I love number 4. It’s something different from the normal styles and it would definitely make you stand out from a pack! This is so neat! Which online stylist service did you like the best? I think Golden Tote is still my favorite… Skies are Blue is one of my new favorite brands and my totes have had an item from them each time. Honestly, you can’t go wrong with Stitch Fix either if you give a really good style bio and description of what you’re looking for. Let me know if you check them out!